Auréolé du succès international de ses versions 300 SL et 190 SL, Mercedes-Benz fait sensation en dévoilant au salon de Genève 1963 son nouveau roadster: la 230 SL. Sa ligne élégante teintée de sportivité séduit et met en exergue le talent du jeune designer français Paul Bracq. Eu égard à son hard top au toit concave qui rappelle les monuments bouddhistes, le surnom de «Pagode «est ajouté au patronyme SL. 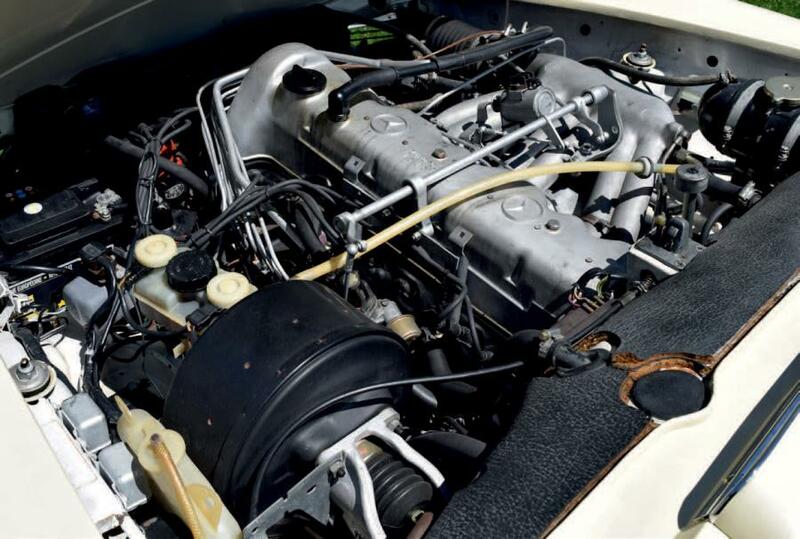 La Mercedes 230 SL est équipée d'office d'un moteur six cylindres en ligne de 2,3 litres qui développe 150 ch et 22 mkg de couple. Donné à l'époque pour 200 km/h, elle était l'incarnation d'une GT performante pour son époque sans pour autant revendiquer le statut d'une vraie sportive. Pagode discrétion rime avec distinction! Notre modèle dispose de tous ses arguments pour séduire son futur acquéreur. 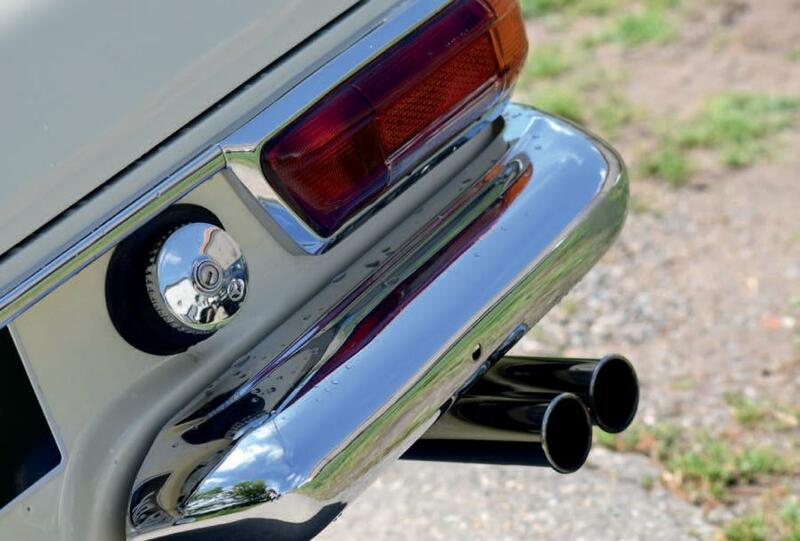 Au-delà de se présenter en excellent état sur le plan de sa carrosserie et de sa mécanique, cette 280 SL offre un mariage de teintes particulièrement élégantes. Geneva Motor Show in 1963. Its elegant, sporting lines won over the public and underlined the talent of the young French designer Paul Bracq. Thanks to its concave hard top which recalled the form of the Buddhist temples, the sobriquet ‘Pagoda' was added to its SL model name. 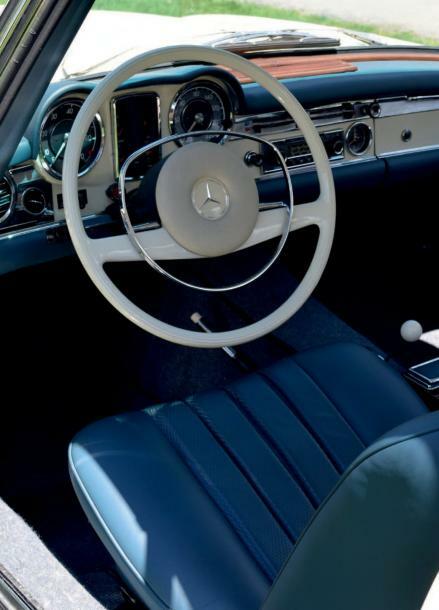 The Mercedes 230 SL was fitted as standard with a 2.3-litre 6-cylinder in-line engine developing 150 bhp and torque of 159 lb-ft.
With a top speed quoted at the time of 125 mph (200 km/h), the SL embodied the high-performance GT car of its era, without being an out-and-out sports car. 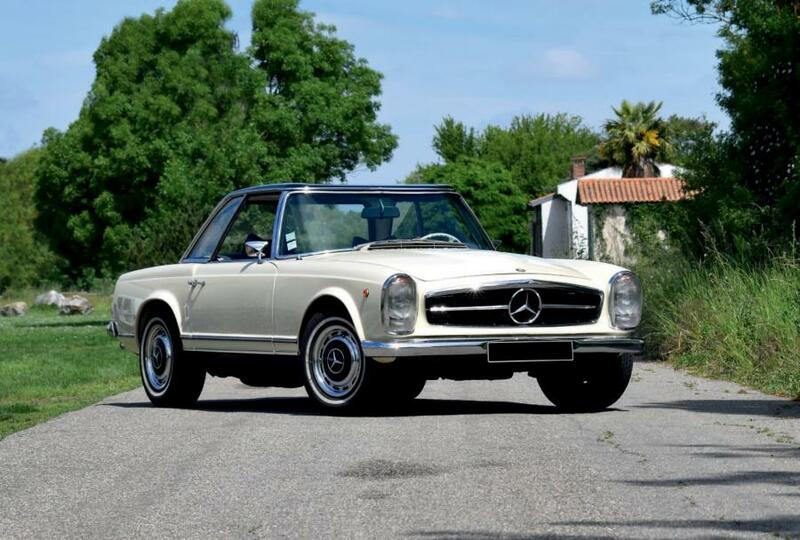 At the end of 1967, Mercedes-Benz introduced the 280 SL. Its engine was an evolution of the 6-cylinder in-line unit, re-bored to give a capacity of 2.8 litres and producing 170 bhp and torque of 177 lb-ft. Although its top speed remained unchanged, the increased torque improved comfort and in-gear acceleration. Right up to 1971, when production ended after 23,885 cars had been built, the Mercedes 280 SL ‘Pagoda' was a great success. It is certainly the most accomplished and desirable model in the series; power steering is a must, and automatic transmission is recommended. Behind the wheel of a ‘Pagoda', discretion and distinction go hand in hand! Our car has all these points in its favour to win over its new owner. As well as having very good bodywork and being in excellent condition mechanically, this 280 SL offers a particularly elegant colour combination. According to its option codes, it was delivered new in the States with this distinctive colour scheme, automatic transmission, power steering and a second exterior mirror. With its lustrous cream paintwork, the interior with its magnificent blue upholstery and matching carpets, its immaculate chrome trim, and the perfect condition of its hardtop, interior and original radio, everything about the car is remarkable for its appearance and finish. The woodwork too is in perfect condition, as is its soft top, which was recently replaced. The ignition, fuel injection and suspension were overhauled before the sale.